Life at the court of Louis XVI and Marie Antoinette has long captivated readers, drawn by accounts of the intrigues and pageantry that came to such a sudden and unexpected end. Stefan Zweig’s Marie Antoinette is a dramatic account of the guillotine’s most famous victim, from the time when as a fourteen-year-old she took Versailles by storm, to her frustrations with her aloof husband, her passionate love affair with the Swedish Count von Fersen, and ultimately to the chaos of the French Revolution and the savagery of the Terror. An impassioned narrative, Zweig’s biography focuses on the human emotions of the participants and victims of the French Revolution, making it both an engrossingly compelling read and a sweeping and informative history. What is the sum of a life? The manner in which an individual toiled away the majority of her living hours, the way history chooses to remember her, or how she approaches her final days, trying to live while knowing all that awaits her is death? In evaluating the sum of Marie-Antoinette’s life, the answer to this question is critical. Her rich story has been combed over by many a magnifying glass both during and after her reign as Queen of France, and it’s so full of anomalies that more than two centuries later, it’s still impossible to fully appreciate this historical figure, icon of an era, both vixen and victim. Stefan Zweig, however, in this seminal biography, does his best. In a way he seems to acknowledge the impossibility of it by noting the existence of several distinct Marie-Antoinette’s, one for each distinct epoch of history she occupied in her abridged life of 37 years. He begins with Marie-Antoinette’s voyage to France at the age of 14 to unite the feuding Bourbon and Habsburg crowns. Married to the impotent, indecisive, and altogether unroyal dauphin—soon-to-be Louis XVI, who will keep the most hilarious personal journal of all-time: his entry on July 14, 1789, the day the Parisians take the Bastille and kick off the Revolution reads, “Rien,” that is, “Nothing”—Marie-Antoinette tries to lose herself in a world of superficiality. Gambling, dances, dresses, and theatre occupy her first decade in France. She is the symbol of the era of rococo, the brilliant zenith of an age of luxury and carelessness birthed by Louis XIV. From Versailles she idles away her days, much to the chagrin of her mother, Empress Marie-Thérèse of Austria, who pleads her daughter for political seriousness. Marie-Antoinette responds, “Que me veut-elle? J’ai peur de m’ennuyer,” her words a motto for the era (“What does she want from me? I’m scared of being bored.”). Finally, Marie-Antoinette realizes her mistakes and, late in the game, seems ready to play. The rules have changed, however. Blood and terror rule in Paris. The Queen of France is now “Madame Déficit.” It’s even a greater shame, then, that right when Marie-Antoinette finds herself a meaningful life with two children and a Swedish lover, her life is certainly over. 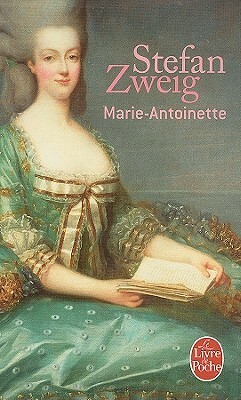 Zweig details this extreme love story and the incredible inner strength Marie-Antoinette demonstrates until her final step on the platform of the guillotine with extraordinary psychological and personal detail. Unlike other biographers, Zweig does not content himself in reciting facts; he is there to unpack and repackage this ill-fated queen’s very essence. His approach is somewhat suspect, based both on personal correspondence discovered in the Austrian archives and the records of her Swedish lover and the Freudian insights popular in Zweig’s time. But it’s so carefully researched, so lovingly researched, that it feels infallible. Lately I’ve been wondering where humans find strength to survive in trying times. Where Marie-Antoinette found hers is a mystery: probably a combination between love for her family and friends and an ingrained, inborn belief that she was divinely royal. Has there ever been such a life? Such a magnificent story? Here Zweig recounts the life of a relic, the last and most gleaming example of an era, left to rot, headless, in an unmarked grave. But what Marie-Antoinette gives us, those who ponder her fate centuries later, is the possibility to remember her, marvel over her, and adopt some of the fortitude and wisdom with which she faced her final days.